Let’s see how Patty is doing with her latest challenge…..
Patty had decided to call The Professor and see what advice he had to offer in preparation for her visit to the facility in Sherbrooke, Quebec that the senior management of her company wanted to buy. She was having trouble understanding how it was possible to have 99.5% yield, great uptime, and balanced lines and still have poor profitability. After a short discussion, The Professor seemed like he was ready to sum the situation up. “Patty, I think you will find that the poor profitability is the result of high rework costs,” he said. “But, Professor, how can that be when the first-pass yield is 99.5%? There is almost nothing to rework,” Patty replied. The Professor chuckled, “Keep an open mind,” he advised. Then he continued, “Don’t worry, you will figure it out in a heartbeat”. Patty wished she could be so confident. As she was about to say good-bye, she mentioned to him her observations of so many teens being glued to their smartphones during her recent Williamsburg vacation. She also shared her concern for her two sons growing up in this over connected world. “Patty, the main thing your sons have going for them is that they have you and Rob as parents. You will help steer them in the right direction, I’m sure. Remember to lighten up a little, after all they are only 5 years old,” The Professor chuckled. As he was about to say good-bye, he thought of something else to share with Patty. “Say Patty, you remember that, here at Ivy University, we have information sessions with high school students that are interesting in coming to our engineering school, right?” he asked. Patty thought for a moment and remembered how impressive that was. It was the only university she knew of in which professors would meet with high school students and their families to discuss the benefits of an Ivy University engineering education. “Sure, Professor, it’s a great thing Ivy U does,” Patty answered. “Because of this program I have spoken to hundreds of high school students, I have also given presentations to high school students in larger groups. Give me a few moments with a high school student and I can tell if they are Ivy U material,” The Professor stated. “How is that possible?” Patty asked. “I look for two signs. The first is if their parents are much more interested than they are, that is a bad sign. The other is that if a high school student finds someone like me interesting, that’s a good sign,” The Professor chuckled and then continued. “I know, to the typical 17 year old, I will seem like a boring nerd, however, to someone passionate about learning, I will likely be seen as a fecund resource, even if they are only 17,” he finished. Patty said farewell to her mentor and called Pete to make arrangements to leave for the Manchester, NH airport, about an hour from their office in Exeter. By the end of the day they were at their hotel in Sherbrooke. They had dinner at a French restaurant and both agreed to try and speak only French. Each of them slipped in a little Spanish inadvertently, a common problem among those who speak several Romance languages. They would discuss using preforms to solve the QFN voiding problem first as they expected this topic to be more controversial. The profitability problem, they would leave for last as they anticipated that this would take time, but were expecting less controversy. After a short drive from the hotel, they were at the facility. Pete commented on the logical way that exits were numbered on Canadian highways, by the number of kilometers from a reference point. In a short time, Jacques appeared. “Ah, my friends, French probably won’t work for us. You speak with a Parisian accent, suggesting you learned European French. Our French has many different words, we almost always speak in English with our customers and partners from France,” Jacques responded. Patty thought a minute and it made sense. Quebec has been separated from France for 250 years, but then it occurred to her that the US and Great Britain were separated for about the same amount of time. Maybe this is why some people say that the US and Britain are two cultures separated by a common language, she thought. They went to a conference room and began discussing the QFN voiding issue. Jacques presented his data and Patty and Pete gave a presentation on how solder preforms can minimize QFN voiding. Patty gave Jacques a copy of Seth Homer’s paper on the topic. Both Pete and Patty were surprised at how receptive Jacques was to using preforms. It seemed that this trip may be easier than they thought. “Jacques, is it OK if Pete and I walk around and observe the manufacturing process for a while,” Patty asked. “Sure, take a couple of hours and then we can go to lunch,” Jacques responded. So Patty and Pete headed off to see the 3 SMT and through-hole assembly lines. Upon entering the facility, they were stunned to see what appeared to be scores of rework operators. Patty went over to observe more closely. It appeared that right after the PCBs were assembled they were visually inspected. Many of the boards went directly to a rework station. The boards that appeared to pass the visual inspection, went to an in-circuit testing. Most of these boards, also went to rework stations. The so-called first-pass yield was obviosuly measured after all of this repair work. “Pete why don’t you check out the rest of the processes, I’ll stay here and see if I can get a true first-pass yield count,” Patty suggested. So Pete went off to observe the other parts of the SMT and though hole processes and Patty stayed and counted boards to determine first-pass yield. After a little more than an hour, they met in the break room to sum up the situation. “Well, for the hour I was there, 150 boards were assembled on the one line I was watching. The first-pass yield was only 24%,” Patty groaned. “I can top that!” Pete replied. “They have a pencil pusher,” he chuckled. “Yep! Same scenario,” Pete responded. Several years ago, Patty and Pete were at a shop in Mexico, and observed an operator pushing a component, on a board that had exited a component placement machine, with a pencil. The component was out of alignment and the operator was straightening it. No one knew how to program the placement machines to correct for this error. “Any other interesting phenomena?” Patty asked. “They use the same paste and print parameters, no matter what the stencil. It’s no wonder their first pass yields are low,” Pete finished. As they summed things up, they were a little down, as they recalled past adventures when they had to deliver bad news. Patty, then had an idea. “Pete, why don’t we offer to have you come here for a week or two to help them?” Patty asked. “Sounds like fun,” Pete replied. “But we have to get them to agree that first pass yield is measured as the boards come off the assembly line. Without this metric they can’t assess where their processes need improvement,” Patty added thoughtfully. “And we need to plot the defects on a Pareto Chart to develop a continuous improvement plan,” Pete commented. Figure 1. 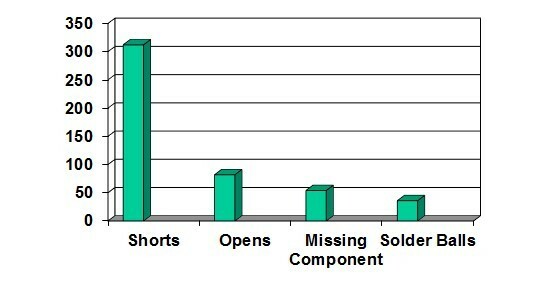 A typical SMT Board assembly Pareto Chart. "It is amazing that their line balancing and uptime are so good,” Pete added. They were both apprehensive as they met with Jacques. They remembered some of the times that folks became hostile when bad news was delivered. Patty did the best she could to keep it positive. She started with their strengths (uptime and line balancing) and complimented them on how strong these important metrics were. She then shared their “opportunities for improvement” and offered Pete’s help. “My friends, thank you. What a gracious offer. I accept,” Jacques said gratefully. "I guess the workshops I attended on uptime and line balancing paid off. They were presented by this interesting chap everyone calls The Professor," he finished. Patty and Pete were stunned by how well this trip went. They enjoyed a delicious French lunch at a café near the plant, with Jacques. On the trip home they chatted about how important it is to the measure first pass yield before any rework is done, and to plot the defects in a Pareto Chart to lay the foundation for improving yields. Patty now understood what The Professor meant when he said, “look at the rework costs,” they were reworking before they measure their yields. Epilogue: Two months later true first pass yield was at 94%. Costs plummeted with less rework and business soared. As a result of the increased business, full employment was maintained. Patty’s company did end up purchasing this facility. In addition, Patty and Pete became fast friends with Jacques. Note: As always, this story is based on a true incident.